Are you up to date on the regulations for handling and transporting Dangerous Goods? The IMDG Code or International Maritime Dangerous Goods Code is accepted as an international guideline to the safe transportation or shipment of dangerous goods or hazardous materials by water on vessel. On January 1st, 2018 the new 38th amendment of the IMDG Code will become mandatory. Already applied on a voluntary basis since January 2017, the amendments are quite extensive and may require additional training of your employees in order to be in full compliance. 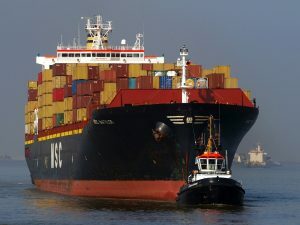 Since its inception in 1965, and being made mandatory from January 2004, the IMDG Code has been continuously updated and revised for technical and transportation requirements of specific substances in order to keep up with the rapid expansion in the number of new products and changes in the shipping industry as a whole. The dangers of Polymerizing substances has been addressed by allotting them to Class 4.1 under new UN numbers. to them while differentiating them under different Classes in the DG List. 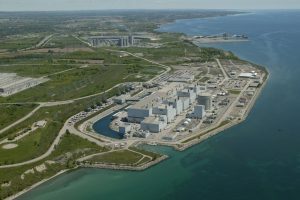 As reported by CTV News, Ontario’s proposed plan for how to respond in the unlikely event of a nuclear emergency falls short, environmental groups say. 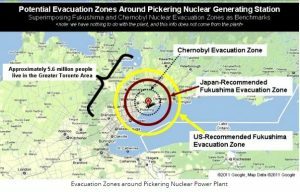 The province recently released an update to its emergency planning for potential large-scale accidents at the Pickering, Darlington, Bruce Power, Chalk River and FERMI 2 nuclear sites. It deals with co-ordinating responses and public communication, zones and evacuation procedures, preventing food and water contamination, and limiting exposure to radiation. The environmental groups, including Greenpeace and the Canadian Environmental Law Association, say the proposal isn’t based on a large enough incident, and needs to plan for an accident on the scale of the 2011 nuclear disaster in Fukushima, Japan. “Given we’re seeing nuclear accidents at the international level about once a decade, we need to prepare for such events,” said Shawn-Patrick Stensil with Greenpeace. Community Safety Minister Marie-France Lalonde said the plan “definitely” covers a Fukushima-scale accident. “We’ve learned many things from the event in Japan, unfortunately,” she said. Better communication with the public, particularly those living near nuclear sites, is needed, said Theresa McClenaghan, with the Canadian Environmental Law Association. Environmental advocates have for years been urging a wider distribution of those potassium iodide, or KI, pills. Radioactive iodine is released in the event of a nuclear accident, and the potassium iodide pills can help protect against thyroid cancer. The pills are currently distributed to households and businesses within a 10-kilometre radius of the nuclear sites, but the environmentalists want that to be 50 kilometres. People outside the 10-kilometre radius can currently request the pills. The groups also say the government has no comprehensive plan to address potential contamination of the Great Lakes, which are a source of drinking water for millions. Lalonde said bottled water would be distributed. The plan sets out different plans for different zones around the nuclear sites. Priority evacuations will be in the contiguous or adjacent zone, three kilometres around Pickering, Darlington and Bruce. A primary zone of 10 kilometres around those sites will see measures against exposure to a radioactive plume. In a secondary zone, 50 kilometres around those three sites, the plan takes steps to prevent ingestion of contaminated food and water. The plan is posted for public comment until July 14 on the province’s regulatory and environmental registries. Lalonde said experts will be reviewing all the comments to decide what changes need to be made. As reported in Northern Ontario Business, a Thunder Bay, Ontario biotech company has developed a solution to remediating contaminated industrial sites in Northern Ontario. There is a growing demand in the Hazmat industry for equipment that can rapidly identify chemical or biological agents involved hazmat incident. Chemical detection equipment are generally used to identify the presence and intensity of chemical agents in soil, air as well as water and to alert respective authorities and personnel to the existence of toxic or hazardous substances, so necessary action can be taken to prevent catastrophes, as it can be dangerous whether it is in a weaponized or non-weaponized form. The report claims that chemical detection equipment which is small, effective, simple and relatively cheap is in trend. Portable chemical detection equipment with infrared technology & Raman spectroscopy has already captured a major market share due to the above stated reasons. The report states that North America is a major market for chemical detection equipment as continuous research and development is required in this field and the United States is a leader in the R&D of chemical detection technology. A recent market report prepared by Market Insight Reports predicts that the global market for CBRNE detection technologies will reach $10 billion (U.S.) by 2022. The Global CBRNE Detection Technologies Industry 2017 Market Research Report provides a unique tool for evaluating the market, highlighting opportunities, and supporting strategic and tactical decision-making. The report breaks down market competition by top manufacturers, with production, price, revenue (value) and market share for each manufacturer. The top players in the CBRN detection marketplace include Argon Electronics, Blucher GmbH, Bruker, FLIR Systems, HDT Global, MSA, and TSI. Geographically, this report is segmented into several key Regions, with production, consumption, revenue (million USD), market share and growth rate of CBRNE Detection Technologies Industry in these regions, from 2012 to 2022 (forecast), covering North America, Europe, China, Japan, Southeast Asia, India. Aerialtronics, a Netherlands-based commercial UAS manufacturer, and RAE Systems BeNeLux, a provider of gas and radiation detection systems, recently announced an integrated technology partnership that they claim will help keep professionals and the public safe from invisible toxins in the air. The two companies claim that the collaborative technology will detect gas and gamma radiation aerially to increase safety, improve mobility and streamline data analysis for professionals. 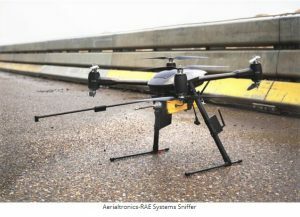 The technology that will be developed through the partnership will enable professionals, such as first responders and site managers, to assess potential HazMat risks in unstable environments by detecting and monitoring gasses, chemical threats and radiation from a safe distance using the MultiRAE Pro and MiniRAE 3000 monitors integrated into the Altura Zenith ATX8 UAS. This collaboration is critical to improving awareness, safety and mobility for professionals in the inspection and first response industry by allowing them to assess the potential dangers of atmosphere they are working in from a safe distance. If a chemical fire breaks out, firefighters need to be aware of the potential threat of toxins being released into the air before entering a burning building so they can effectively protect themselves and civilians. Chemical engineers and site managers must also be alerted of the presence of HazMats before they are exposed to them at a construction site. The integrated Zenith with gas and radiation monitors can collect comprehensive data from a toxic environment which is then transferred to a ground station up to 3 kilometres (1.8 miles) away for real time data analysis and processing. This is essential to keeping individuals safe because wireless alarms at the central command station will automatically ring if any toxins are present in the air. There are unique alarms for each potential threat, which allows individuals to react quickly and appropriately to different scenario’s like HazMat incidents or leak detection from a safe distance. This will lower their risk of exposure to dangerous chemicals and compounds found on site, as well as protect the public that is in the nearby vicinity. The MultiRAE Pro and MiniRAE 3000, created by RAE Systems, are monitors that check for a variety of threats present in the air. The MultiRAE Pro can contain multiple customisable sensors for detecting gamma radiation, toxic and combustible gases, volatile organic compounds (VOCs) and oxygen levels. There are a total of 25 different sensors available to monitor a range of threats with up to parts per billion precision. The MiniRAE 3000 is a highly accurate VOC monitor which uses a photoionization detector with parts per million measurement precision. This newly integrated technology will prove to be beneficial to professionals in industries working with poisonous chemicals, gasses and radioactive materials, such as Energy and Chemicals, as well as first responders and Search & Rescue personnel. Leidos (NYSE: LDOS), a global science and technology company, was recently awarded a prime contract by the U.S. Transportation Security Administration (U.S. TSA) to continue to provide hazardous materials management and disposal services at more than 440 airport screening checkpoints across the United States and abroad. The single-award, firm fixed-price contract has a one-year base period of performance, four one-year options, and a total contract value of $45 million if all options are exercised. Work will be performed at all U.S, TSA continental United States, Alaska, Hawaii, South Pacific and U.S. Virgin Islands screening checkpoints in federalized airport locations. Leidos is a global science and technology solutions company working to solve the world’s challenges in the defense, intelligence, homeland security, civil, and health markets. The company has 32,000 employees. 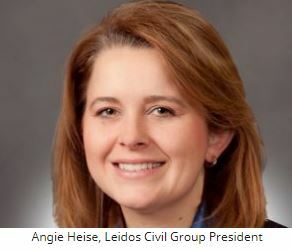 Leidos reported annual revenues of approximately $7.04 billion for the fiscal year ended December 30, 2016. The Ontario Environment Industry Association cordially invites you to attend a Reception and Dinner with The Hon. Glen Murray to celebrate ONEIA’s 25thAnniversary. The reception and dinner with the Minister will follow the fifth annual Ontario Environment and Cleantech Business and Policy Forum on May 30 and run from 5:30 to 9:30 PM at the Doubletree by Hilton Hotel in downtown Toronto. Join companies like Waste Connections of Canada, Terrapure, Willms & Shier Environmental Lawyers LLP, Fielding Environmental, Norton Rose Fulbright LLP, XCG Consulting, RCCAO, LafargeHolcim, Walker Environmental Group and RWDI who have already reserved their table. To discuss your corporate table, please contact Ellen Greenwood at ellengreenwood@rogers.com. Or join us as an individual for the dinner for just $249. Please purchase your ticket HERE. If you are already registered for the day-long Forum you can add an individual ticket for just $149 HERE. Research and Markets recently released a report on The Global Hazardous Waste Handling Automation Market. 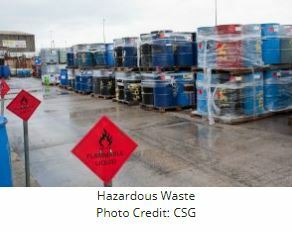 According to the report, the global hazardous waste handling automation market is expected to grow at a Compound annual growth rate (CAGR) of 8.50% for the period 2014 -2019. Hazardous waste management is the collection, disposal and treatment of harmful materials. If improperly handled, it can cause substantial harm to human health and the environment. These include waste materials generated on a day today basis by people, power plants, and manufacturing companies. The report breaks down the global hazardous waste handling automation market into Products, Type of Waste, End User, Geography, Vendor Analysis Forecasts and Trends from 2016 to 2021). Some of hazardous wastes can be handled manually while some may require expertise and automation solutions to minimize human contact with the waste. 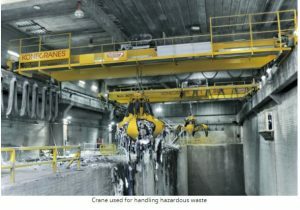 Use of such automation solutions for handling waste also improves the process efficiency and reduces the reliability on manual intervention. Thus, concerns about proper handling of these harmful substances can be eliminated. The report talks about the key factors that contribute to the growth in the Global Hazardous Waste Handling Automation Market, discussing the trends, technology overview providing the recent developments and the products available in the market. To discuss this, the market has been segmented based on types into manipulator arms market, telescoping masts market, cranes market, trusses market, size reduction systems market. The market is also classified based on the type of hazardous waste, that is, Listed Wastes, Characteristic Waste, Universal Wastes, and Mixed Wastes. It also provides region and country specific forecasts of the market, giving a detailed insight on the market’s performance. In addition it also talks about the competitive landscape, some of the key players discussed in the report are PAR Systems, Konecranes, DX Engineering, Floatograph ® Technologies, among others. As reported in the Daily Commercial News, a recent report issued by the Residential and Civil Construction Alliance of Ontario (RCCAO) stresses the measurement of not only the quantity but the quality of excess soil from excavations so that effective management tools can be put in place. The report, 2017 Update: Quantification of Excess Construction Soils in Ontario, is an update of a 2012 report on the same subject that was commissioned, in part, due to a request from the Ministry of the Environment and Climate Change (MOECC). Report author Frank Zechner, a Toronto-based environmental lawyer, estimates 25.8 million cubic metres of excess construction soil was produced in 2015 from municipal infrastructure, residential and ICI projects. That figure is up from the 2012 report, which provided a range of 20 to 24.4 million cubic metres of construction fill generated. He said the numbers will continue to rise with governments expected to make more investments in infrastructure in the coming years. The MOECC released its Excess Soil Management Policy Framework in December 2016and the RCCAO decided it was time to update the excess soil numbers. The 2012 study provided estimates for different construction sectors from 2008 to 2010 and the intent for the recent study was to do the same, but data sets formerly provided by Statistics Canada are no longer available, the report states. Therefore Zechner had to rely on other data to fill in the gaps. “You’re trying to develop policies and manage what you perceive to be an issue and so you need two measurements — you need quality and you need quantity. Even if we know that there are 25.8 million cubic metres of excess soils, is it contaminated? We don’t know and that would be the other half of the equation,” he said. The average dump truck carries about 10 cubic metres of soil, so if the volume of the Rogers Centre is 1.6 million, that means it would take 160,000 dump trucks to fill it up, then multiply that 16 times, explained Zechner. The cost of excess soils is also adding up for many contactors as well. “We did other studies for the RCCAO a number of years ago and the capital cost for management of excess soils can be more than 10 per cent of capital costs of the project,” said Zechner. The answer, he said, is more tolerance in terms of where the soil can go. The focus now is to try to get a handle on what the quality of the soil is and then passing appropriate policies and regulations so that relatively clean soils can be put into places where it can be beneficially used such as parks, golf courses, ski hills and berms. The RCCAO has worked in collaboration with the MOECC for years to promote best management practices and develop policies for implementing an excess soil management policy framework. They have put a proposal forward to the MOECC to establish Soils Ontario which would undertake studies to measure the quantity and quality of excess soils being generated in different sectors. “We need to set up this organization that is able to track all municipal projects and other development projects and how much soil movement there is,” said Andy Manahan, executive director of the RCCAO. 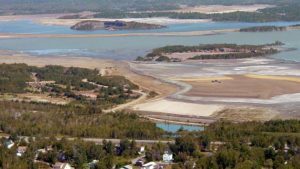 He would like to see municipalities use best management practices wording in tender and soil bylaw documents to reduce the current “dig and dump” approach. “We’re at ground zero in Ontario and if we can start doing good data collection, we’ll be making better decisions in the long run,” said Manahan.